Vietnamese salad is always refreshing and appetising. Nuoc cham sauce is so simple to make but so delicious to accompany any Vietnamese dishes. Lemongrass flavoured pork noodle salad is popular in all Vietnamese Cafes or restaurants in Hong Kong. I love it. It's called 'Huon mau gee pa dung mung 香茅豬扒凍檬' in Cantonese. No sure whether this is authentic Vietnamese or what it is called in Vietnamese. 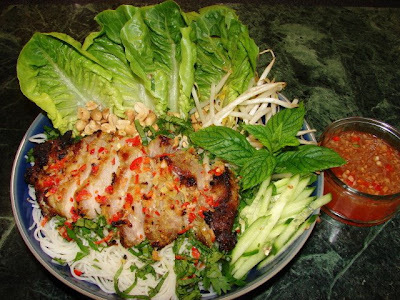 The recipe is simple, consists of some char grilled/oven grilled pork marinated with lemongrass, some salad vegetables, herbs and rice vermicelli all dressed with nuoc cham sauce. Put pork in a plastic bag and bash with a rolling pin to loosen the meat fibres to tenderise pork and to absorb more marinade. Finely chop all the spices/herbs for the pork marinade. For the lemongrass use only the last few inches tender part and remove the first/two wooden layers, cut lemongrass into paper thin rings then finely chopped. Mix this with the rest of the ingredients and marinate the pork for at least 1 - 3 hours. Soak rice /glass noodles in warm water till softened, then drained. Make the nouc cham sauce. Put in a serving bowl. Char grill or oven grill the pork till golden brown. The left ovcr marinade I did not throw away but brown with some oil till caramelised, quite nice with the noodles. Blanch the noodles in boiling water till soft. Rinse with cold water then drain thoroughly. Put noodles on the serving plate, garnish with salad and peanuts. Slice pork and put on noodles. Ready to serve. Drizzle nuoc cham sauce all over. This dish sounds like my husband's fav noodle dish: Bun Thit Nuoung - Vietnamese Grilled Pork with Vermacelli. He always orders it when we go to a Vietnamese Restaurant (London). He is half chinese and half vietnamese. The one we eat is not marinated with lemon-grass but I have collected recipes that use it as well as don't. In Hong Kong, they call this kind of vietnamese noodle dish Moong Fun 檬粉. The first time we took my cousin to the vietnamese restaurant she went crazy for 'Moong Fun'. She kept asking the waiter whether they did it and they had no idea what she was talking about! She was trying to describe it to my husband and he had not the faintest idea what she was talking about either! It was funny! Thanks for the correct Vietnamese name. I had 'gee pa moong fun' (pork chop vermicelli) lots of times in HK, also like the Vietnamese sausage moong fun too. Not easy to find the right moong fun in UK supermarkets I have only seen them few times. Vietnamese sausage? Does it look like salami? Tastes bit fermented and sourish? I tried that one 'Nem Cha' I think it was called. Didn't like it. Bet pork chop vermicelli is nice - that sounds like a Hong-Kong adaptation! We didn't eat vietnamese food when in HK. Shame would have been nice to see if it was authentic! You should try a vietnamese restaurant in East London if you get the chance! My fav is the sizzling crepe - Banh Xeo. Delicious! I must try and make it one day! No it's not the fermented sausage I was talking about cha lua, kind of like spam. Ah, I know the one - made from chicken and/or pork. In vietnam it's made into a fat cylinder shape and wrapped with bamboo leaf I think. We had one as a gift from my bro-in-law one year from Vietnam. Have seen it in the fridge at Chinese Supermarkets like Wing Yip - it's in a plastic wrapper which is green - maybe to look like a leaf? Looks like the chicken roll my dad used to buy from cash-n-carry.